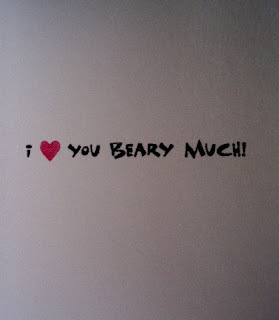 I wanted to make a quick card using this new set from Stampin' Up! SU and Build-A-Bear Workshop teamed up for these exclusive cute stamps called "Beary Best Friends"
Here is the inside of the card using the "Beary Nice Wishes" stamp set. These are both found in the new Holiday mini. 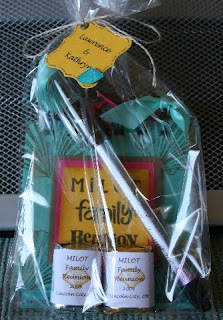 Here are a few items I made for a family reunion. I used Rich Razzleberry, Crushed Curry, Soft Suede, and Bermuda Bay Cardstock. I inked all the edges. 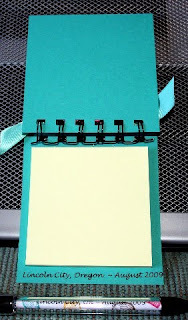 You can't see in the picture, but I used an acetate sheet in between the family reunion cardstock and the Bermuda Bay cardstock just to give it some protection. Here is an open view. 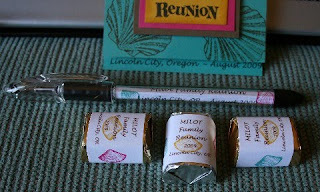 I covered the candy with some labels I printed on the computer and then stamped the small shells with ink. I also used the computer to print the insert for the pen, and stamped the shells with matching ink. This is how they looked after I got them all put together. 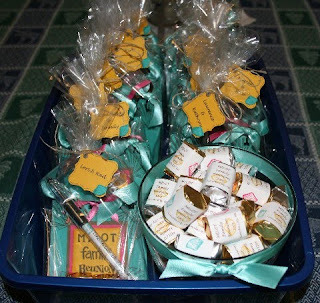 I then tied them with string and put a label on each one. 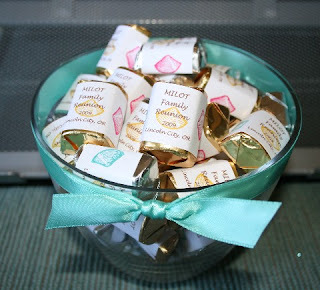 I wrapped the rest of the candy and just put them in a bowl. Here they are all complete. 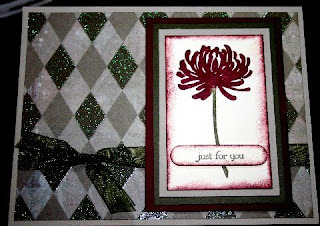 Today's card uses Stampin' Up! 's cardstock: Always Artichoke, Very Vanilla, Bravo Burgundy and Sahara Sand. Inks: Always Artichoke. 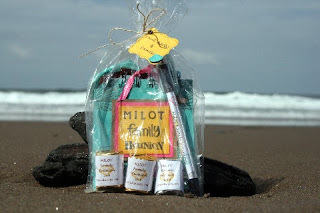 SU Markers: Always Artichoke and Bravo Burgundy. 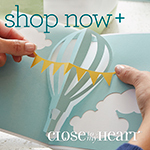 Stamp sets: Kind & Caring Thoughts and Teeny Tiny Wishes. Punch: SU window punch. 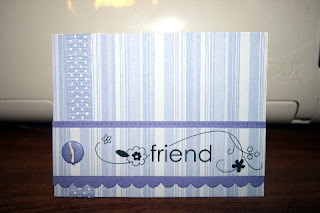 Misc background paper and sheer ribbon. Here is another quick card that I made today. 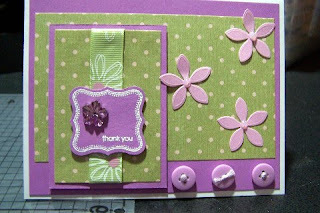 Almost Amethyst designer paper, Almost Amethyst card stock, scallop punch, rub-on and button all from Stampin Up. 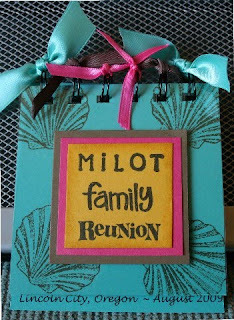 I then used a paper piercer along the top and bottom of the cardstock. 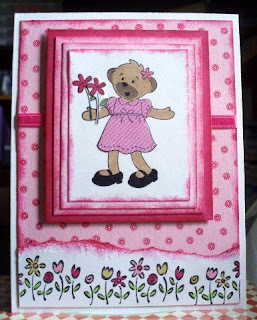 The first one I used Riding Hood Red cardstock from Stampin' Up! and misc paper. The three flowers were punched with a SU punch. The stamp was from SU Pocket Silhouettes stamp set. 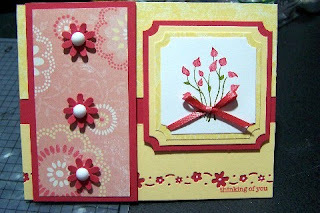 This second card I just kind of threw together today using some papers I had laying around and matched it up with Stampin' Up! Orchid Opulence card stock. 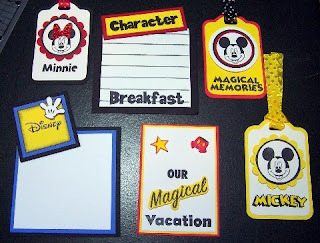 I made these Disney tags, ATC, and Journaling boxes for a swap I was in back in July. I just got them back today and realized I forgot to take a picture before I sent them in. 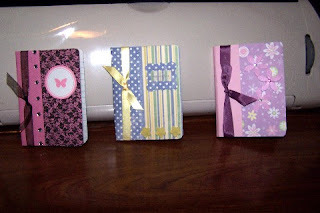 These are some mini composition notebooks that I altered.